Cranberries seem to be one of the more poplar fruits during the holidays. So, for those looking to do something new this year, The Early Show's resident Chef Bobby Flay introduced an appetizing cranberry recipe that can be served as both a breakfast dish and a bread with dinner. Some 340 million pounds of cranberries are consumed in the United States each year. The fruit of autumn is tiny, tart, and full of flavor. It possesses the uncanny ability to spring to life in desserts, savory dishes, sauces and chutneys. From October to December, cranberries can be found, usually in 12-ounce plastic bags at the neighborhood grocery store. Wrapped and refrigerated tightly they can last for at least two months, or frozen up to a year. Traditionally, cranberries are served in stuffing, rice salads, or as a side dish for turkey. On this occasion, Flay created cranberry jam, added orange-honey butter to the mix and introduced some biscuits to the jam mix. Biscuit dough, unlike pie dough, is less of an exact science. Nonetheless, it's important to tap into the finer points of the proper dough consistency, the risk of overhandling the dough, and the thickness of the biscuit. 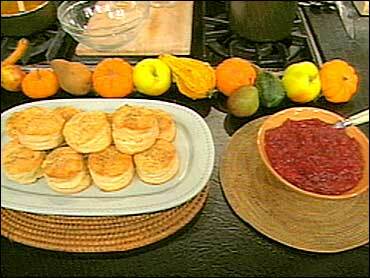 Flay's finished recipe is an amazing mix of taste and texture when the cranberry jam is added to biscuits. Combine juice, sugar, ginger and peel in a medium non-reactive saucepan and bring to a boil over high heat. Cook for 2 to 3 minutes or until sugar is dissolved. Reduce the heat to medium, add the cranberries and salt and cook until the cranberries pop and become soft, about 25-30 minutes. Let the mixture cool to room temperature, then cover and place in the refrigerator until cold and firm, at least 2 hours. Bring juice to a boil in a medium non-reactive saucepan over high heat until thick and reduce to 1/2 cup, whisk in honey and orange peel and let cool to room temperature. Place butter and salt in a medium bowl, add the cooled orange juice mixture and stir until combined. Scrape the mixture into a small bowl, cover and let chill in the refrigerator for at least 2 hours. Remove from the refrigerator 15 minutes before using. Preheat oven to 450 degrees F. Combine flour, baking powder, baking soda and salt in the bowl of a food processor. Pulse twice to distribute the ingredients evenly. Scatter the butter over the top of the flour mixture and pulse 4 or 5 times or until the mixture resembles coarse meal. Add the buttermilk and pulse until the mixture just begins to come together. Scrape the dough onto a lightly floured counter. Pat the dough into a 10 x 12-inch rectangle about 3/4-inch thick. Use a 3-inch round cutter to make 8 biscuits, then place them on the prepared baking sheet. Press together the scraps of dough, and repeat process. Place the biscuits on two baking sheets lined with parchment paper; brush the tops with cream and sprinkle with black pepper. Bake the biscuits for 12-15 minutes or until lightly golden brown. Remove from the oven and brush the tops with melted butter.